three times before she felt like she had mastered it. 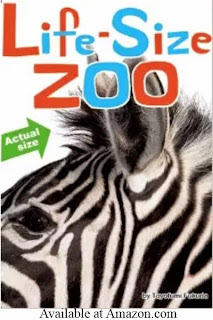 Life Size Zoo- This is a book that we keep coming back to and one that we'd like to own in the future. Opening this book brings you face to face with wild animals in a way that few people ever see. And it's all life-size! So, for the elephant, you only see an eye and part of an ear. For the koala bear, you see the entire animal. 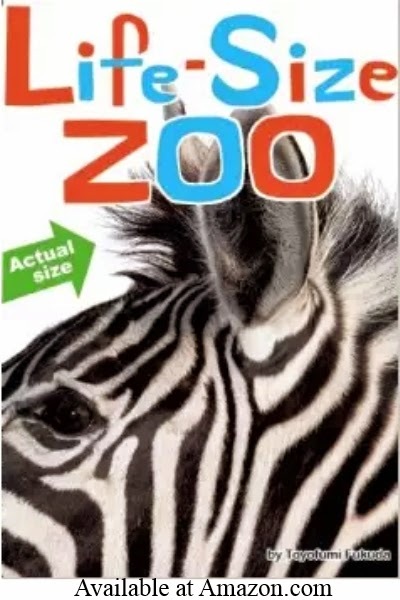 Each page also includes a little informational box about each animal and a diagram showing you how much of the animal is included in the picture. Although my kids enjoy this book, I would actually recommend it for ages 4 and up because of the size of the book and the pages that fold out (not very toddler friendly). 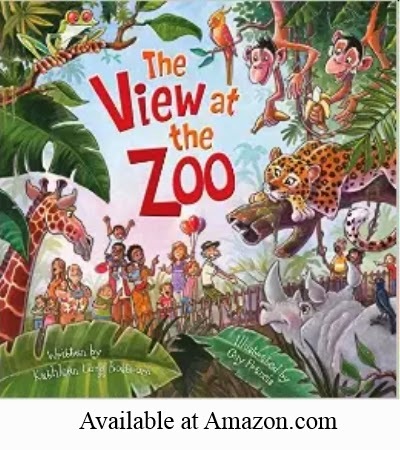 The View at the Zoo- Who is watching whom at the zoo? 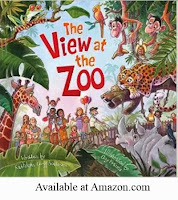 This fun, silly book explores that subject with phrases like "Wake up your cubs, Mrs Bear. Mr Lion, comb that hair." The pictures are engaging and cute. Be sure to look at both the animals and the humans as each line has a double meaning. 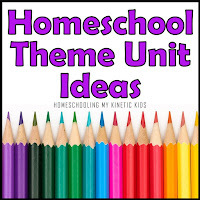 Great fun for all ages but especially for ages 2-5. 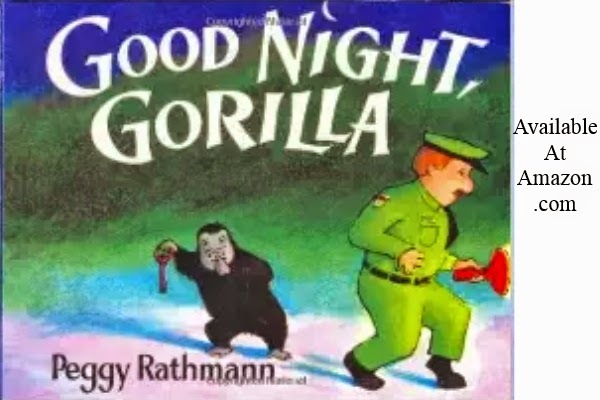 Good Night Gorilla- As I was researching this unit on Pinterest, this book kept being mentioned as a favorite. 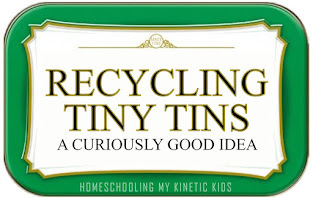 Fortunately, I only checked it out of our library, because it was not a favorite in our family. 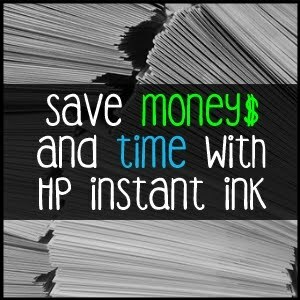 The story is cute but the words are very simple and there are many pages without words at all. I suppose this would be appealing to kids who enjoy storytelling, but it didn't hold my kids attention at all. I believe the recommended age for this book is 2-3 year olds. 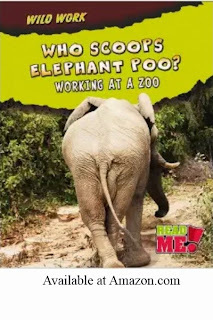 Who Scoops Elephant Poo?- We really liked the "Animal Poo" book because it goes through all the different types of jobs at the zoo. It also has lots of science words, which Dragonfly loves. She was really disappointed that the book wasn't about elephant poop and the bacteria that lives in it. Such a science girl! Who scoops the poop, the poop, the poop? 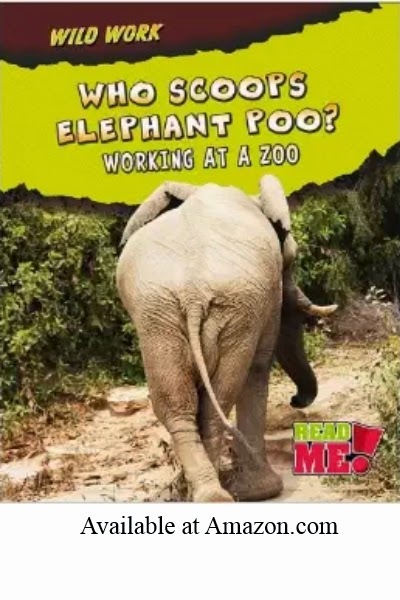 Who scoops the poop, at the zoo? Who scoops the poop, at the zoo! Who makes the food... at the zoo? Who brushes the teeth... at the zoo? Who gives the baths... at the zoo? 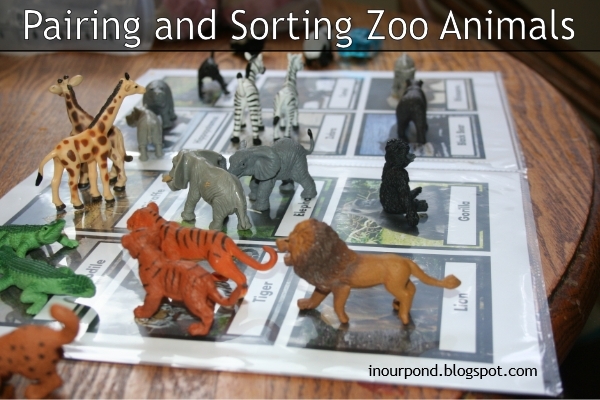 Follow In Our Pond's board "z is for zoo" on Pinterest. Bonus: We found a tiny frog on our house. 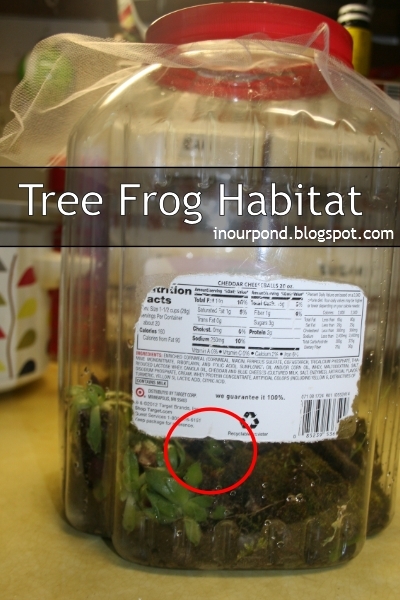 The kids helped me make a habitat for it in a big plastic jug (with netting on the top for air). Our aquarium has dirt, moss, succulents, a water source, and ants. After we spent a long time on the couch watching our frog, I got on the internet to find out more information. I learned that our frog is most likely a "Pacific Tree Frog," which grows to be less than 2" in length. It's also the "state amphibian" of Washington. It's habitat ranges from Alaska to southern California and is the most common species in those areas. 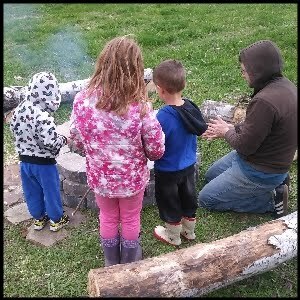 Here's a good article on providing a good home for the frog should we decide to keep it as a pet.